The English Robin or Robin Redbreast as she was known when I was a child was probably the first bird I ever learnt to recognise. Small and plump, bright eyed and endlessly curious about the world of humans, the little robin is part of the fabric of the suburban garden life of so many of us in the cities and towns of England. We never get huge gangs of them, as they are very territorial but we nearly always have one or two in residence, checking out what we do, looking in the windows and engaging in our lives. They squabble and fight, quite badly sometimes and build nests in open fronted boxes and raise their speckly children happily there. This is the one who you saw sitting on the whirly clothes dryer in the Back Door post. I have stretched my little camera to its macro zoom limits to take these so you can see her more clearly. (If you click on the image I think you might get to see it bigger, I have tried to link to where it is stored on WordPress) . She sits on the corner of the dryer most mornings, looking down at the grass, and then whizzes down to pick up worms and grubs. Once she has a beakful she heads off over the fence to my left where I suspect she has her nest. Brian is convinced that she bobs her head at him to tell him the feeder is empty and needs filling and I think he is right, these are the same birds who ask for you to spray the hose for them on hot days so they can take a shower. What adaptive mechanism is at work where a little bird can figure out how to get a human’s attention like that? Currently we are putting out fat balls, finely chopped peanuts, husked sunflower seeds, and assorted fine seed. The bluetits are nesting and raising their babies, I can hear them cheeping in their box on the garage wall. The blackbirds too are on the hunt for food; there are jackdaws off to the side in the neighbours’ chimneys. Greenfinches and goldfinches fly through from time to time; they dance in the tops of the silver birches trilling away, offering glimpses of their delicate feathers and making me catch my breath when I track them down. Even when it has rained all day and the geraniums are collapsed on the path, resembling a damp poodle’s top knot, sodden with water and formless, I console myself for our everchanging and unpredictable weather, because rain means insects hatching, and worms wriggling; all good quality high protein fresh food for the growing birds. Psst.. wanna see some American Robin eggs and babies, head over to Ardys and take a peek! This entry was posted in Garden, Wildlife and tagged birdfood, English robin, Garden, nature, rain, robin redbreast on 29/05/2013 by Joanna. I so enjoyed reading this, it did my heart good! You write so well, Joanna, describing exactly what a robin is like in its habits and movements, they are fascinating to watch, aren’t they? And we need to look on the bright side at the moment because the weather is so depressing, when are we going to get any SUMMER, do you think? 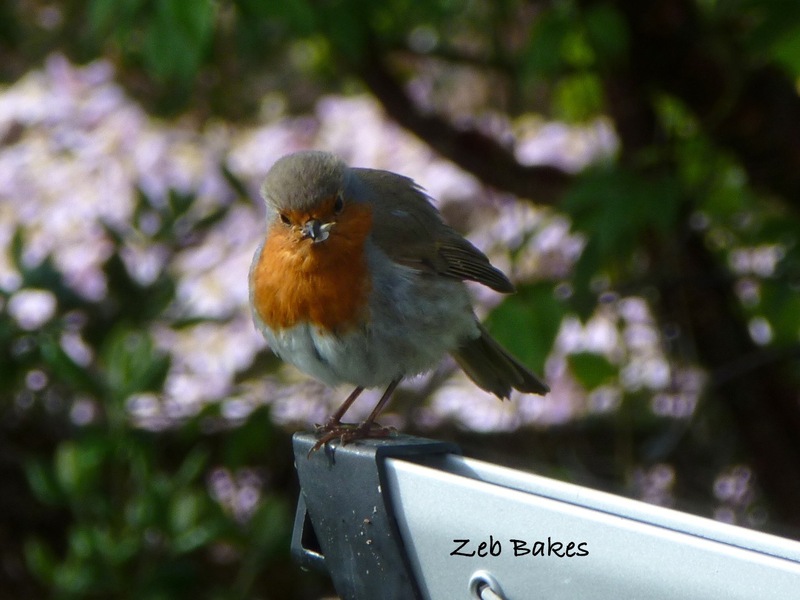 I loved your post and the photos are fantastic – we too have a resident robin whom we cherish. We have a feeder in our lilac tree and love watching the birds coming down to feed. They have even managed (we think it is the blackbird) to lift the top off the feeder (even though Kevin clicks the latch closed) so that they can peck down into the food! We have seen far more birds this year – we think this is because our beloved Burmese is no longer around and our ‘moggie’ hardly ever goes out. We have seen goldfinches for the first time this year and I agree they are simply beautiful – flashed of red and yellow. I have tried to take a photo but alas I am too slow. The goldfinches are hard to get. If you buy a special niger (fine black seed that they really like) feeder, and fill it up and hang it near the house – they might come to that. It is famous for attracting them. Clever blackbird lifting the latch off the feeder! Was thinking of you today and we must meet up soon ! Good morning! You’ve put me in such a good mood this morning. Me with my cup of coffee, reading your post about nature and life and renewal … and I feel invigorated. And we have sunshine this morning, so the birds are singing. Life just doesn’t get much better for a simple woman (like me) than this. I wish you a lovely and happy morning, Joanna. Reading your post my morning started on a happy note. I had robins and many other birds in my garden in Germany, too. One thing I miss most, living in Maine, is the complete absence of song birds. I always loved waking up to a chorus of singing birds, and, also, found it very comforting in times I were sad. Here we hear only a squawk or a caw no and then. That is very sad to hear. I would miss the garden birds terribly Can you attract them by planting trees or shrubs? . I am glad you enjoyed the post Karin even so. Beautiful post Joanna! Your bluebird almost looks to have a certain expression on his face. I think he is trying to communicate something to you. I love your description, in a reply above, on how the perfect summer ‘ought’ to be. I would relish a day too, with only bird noise, and no music, screaming children, or motorcycle revving noises. I would be over to your backyard in a heartbeat to chat, while we sipped tea and ate biscuits. I love hearing how you describe your birds. I’m wondering if your goldfinches look like ours. Our robins are so tame here. They stand right by my husbands side, as he digs in the yard, begging for him to throw them all the grubs he finds. He tosses, they gobble, and then wait for more. Does your goldfinch have reddish-brown on its face, some brown on its body and just a little bit of yellow on its wings? Yes, like this European Goldfinch do you have that sort or do you have this sort American Goldfinch ? They are great fun, sounds as if you are a birdllover too :) Apart from being woken up at 5 am – a person could get s little fed up with that. I’m so glad to be reading this – new laptop equipped with Windows 8 and I am slowly getting acquainted with it! Lots of birds in my garden – honeyeaters, wattle birds, doves, wagtails,magpies, ravens (which we all call crows) and in the summer parrots, lorikeets and the occasional flock of cockatoos. I once even had a pair of ducks land on my fish pond – luckily Spot didn’t see them! We have weird and wonderful birds that come to our garden including HUGE black cockatoos and a solitary snow white ospray that makes every bird run for cover (including our hens!) when he decides to visit on the odd occasion he chooses to drop by. We have Grey Shrike Thrushes that come to our kitchen window sill for tiny cubes of cheese when the going gets tough and we also have tiny little blue wrens that come as well. They are MUCH bossier than the shrikes though! I have had a 1oz wren stand at the window glass while I was doing dishes and read me the riot act because there wasn’t any cheese when she came ;). How do they keep the birds out? Do they shoot them? I remember watching a film about the Cane Toad.. I am glad you have apple muching blackbirds to keep you company. They have the most beautiful song, in fact one is singing away in the garden right now. I was reading up about the robin this morning and one site suggested that they used to follow wild boars out foraging and snuffling around for roots and then they would grab the worms that the boars tossed up into the light, and now they’ve switched to us instead as we do much the same thing in our gardens. As far as the robin is concerned I am just a wild boar (hee hee). The hose thing was very strange though, I couldn’t quite believe it at the time, but they are smart and observant little birds. I do love your cheery robin, my mum quite often used to have a robin visit her when she was working in the garden, I guess he was after the worms in the freshly turned soil. I’m not very good at identifying the birds I see at all, but get excited when I see something I recognise but don’t see very often such as thrushes or jays. Plenty of blackbirds and magpies round here.